In this application protocol, we describe the viral transduction of human HSCs isolated from various sources, their concomitant expansion in defined cell culture conditions, and analysis of their function using flow cytometry or colony-forming assays. PE buffer: phosphate buffered saline (PBS), pH 7.2, and 2mM EDTA. Keep buffer cold (2–8 °C). MC CD34 Stem Cell Cocktail (# 130-093-427) for flow cytometry analysis of separated cells. (Optional) Fluorochrome-conjugated antibodies for flow cytometry analysis, e.g., CD34-FITC (# 130-081-001), CD34-PE (# 130-081-002), CD34-APC (# 130-090-954), CD133 (293C3)-PE (# 130-090-853), CD133 (293C3)-PE (# 130-090-854), CD45-FITC (# 130-080-202), CD45-PE (# 130-080-201), or CD45-APC (# 130-091-230). For more information about antibodies refer to www.miltenyibiotec.com/antibodies. PBE buffer: Prepare a solution containing phosphate-buffered saline (PBS), pH 7.2, 0.5 % bovine serum albumin (BSA), and 2 mM EDTA by diluting MACS BSA Stock Solution (# 130-091-376) 1:20 with autoMACS® Rinsing Solution (# 130-091-222). Keep buffer cold (2−8 °C). Degas buffer before use, as air bubble could block the column. MACS Columns and MACS Separators: CD34+ cells can be enriched by using MS, LS, or XS Columns (positive selection). 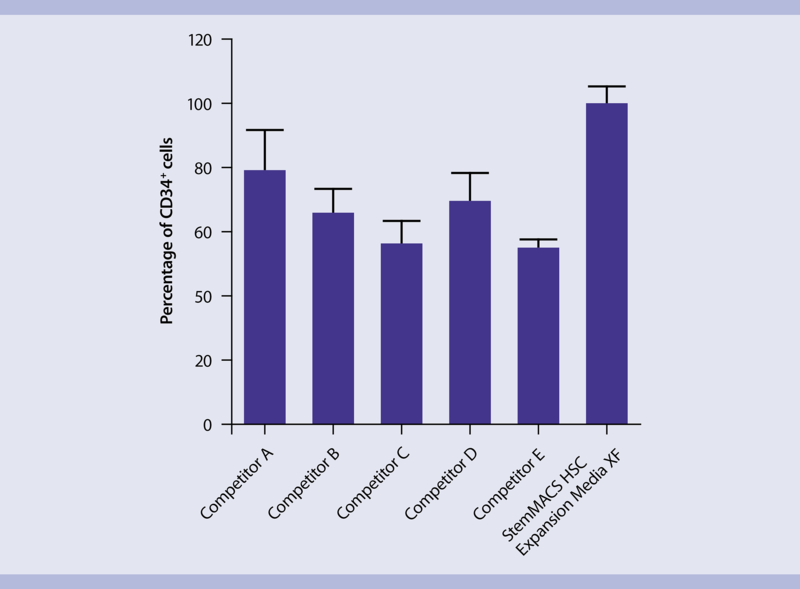 Cells that strongly express the CD34 antigen can also be depleted using MS, LS, or XS Columns. ▲ Note: Positive selection or depletion can also be automated using the autoMACS Pro or the autoMACS Separator. Prepare a solution with phosphate buffered saline (PBS), pH 7.2, and 2mM EDTA. Keep buffer cold (2–8 °C). ▲ Note: EDTA can be replaced by other supplements such as anticoagulant citrate dextrose formula-A (ACD-A) or citrate phosphate dextrose (CPD). Prepare a solution containing phosphate-buffered saline (PBS), pH 7.2, 0.5 % bovine serum albumin (BSA), and 2 mM EDTA by diluting MACS® BSA Stock Solution 1:20 with autoMACS® Rinsing Solution. Keep buffer cold (2−8 °C). are not recommended for use. Isolate mononuclear cells by density gradient centrifugation using Ficoll-Plaque™. Follow the Ficoll-Plaque™ protocol from the data sheet corresponding to the source tissue. Isolate CD34+ cells among the mononuclear cells using the CD34 MicroBead Kit UltraPure, human and LS or MS columns. Follow the protocol of the kit data sheet. We recommend filtering the magnetically labeled cell suspension before separation on the column to guarantee a single-cell suspension. Place a Pre-Separation filter (30 µm) on the separation column. Rinse the column three times with PBE buffer, pre-wetting the filter. Apply the cell suspension and the washing buffer to the filter on the column. High purity CD34+ cells isolated from a PBMC sample using the CD34 MicroBead Kit UltraPure. CD34+ cells were isolated from a debris-rich PBMC sample using the CD34 MicroBead Kit UltraPure, two MS Columns, and a MiniMACS™ Separator. Cells were stained with CD34-PE, CD45-FITC and propidium iodide. Cells were analyzed after gating on propidium iodide–, lymphoid cells. Reduced debris carry-over during CD34+ cell isolation. A comparison of the ungated forward scatter versus side scatter profile of the same sample after separation with the CD34 MicroBead Kit or the CD34 MicroBead Kit UltraPure demonstrates reduced debris carry-over with the CD34 MicroBead Kit UltraPure. Isolated CD34+ cells can be transduced using retroviral or lentiviral vectors. Perform transduction either directly after enrichment or after pre-stimulation culture in StemMACS™ HSC Expansion Media XF supplemented with StemMACS HSC Expansion Cocktail. Use Vectofusion-1®, a novel transduction enhancer, to boost transduction efficiency. Follow the protocol of the data sheet. For expansion, culture the isolated CD34+ cells in StemMACS™ HSC Expansion Media XF supplemented with StemMACS HSC Expansion Cocktail. Follow the protocol of the media data sheet. High levels of CD34+ cells. Cryopreserved CD34+ cells separated from cord blood were expanded for 7 days in the indicated media supplemented with StemMACS HSC Expansion Cocktail (n=4; mean +/– SD). Values were normalized to StemMACS HSC Expansion Media XF. 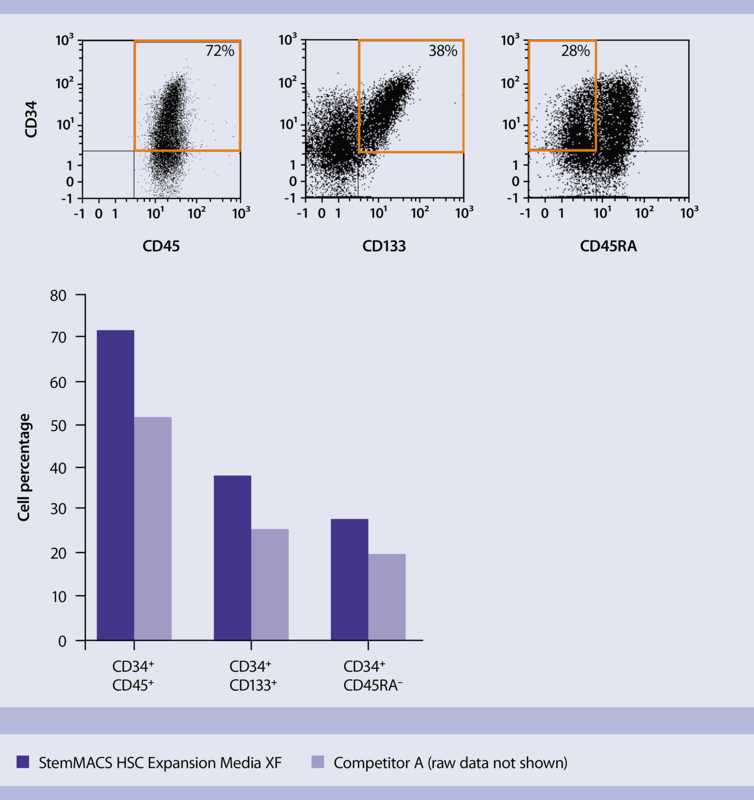 StemMACS HSC Expansion Media XF consistently maintains high levels of CD34+ cells during expansion. 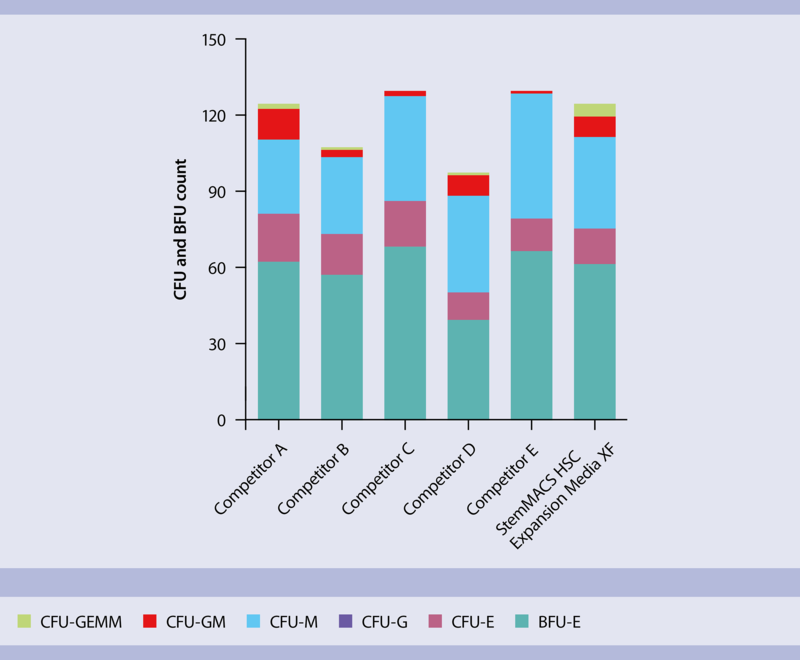 Analyze the expanded CD34+ cells for HSC-specific surface markers via flow cytometry using REAfinity™ antibodies, or perform CFU-GEMM analysis to assess their myeloid differentiation potential. hematopoietic progenitors and typically show a higher proportion of phenotypically primitive cells. CD34+ cord blood cells were expanded for 7 days in StemMACS HSC Expansion Media XF (red) or alternative media (blue) supplemented with StemMACS HSC Expansion Cocktail. The cell surface phenotype was assessed by flow cytometry. Cells expanded in StemMACS HSC Expansion Media XF maintain the characteristic surface phenotype of early hematopoietic progenitors and typically show a higher proportion of phenotypically primitive cells. Preserved broad differentiation potential. Isolated CD34+ cord blood cells were expanded in the indicated media plus StemMACS HSC Expansion Cocktail. After 7 days, cells were analyzed for their CFU potential. Cells cultured in StemMACS HSC Expansion Media XF maintained broad hematopoietic differentiation potential, giving rise to all major CFU types, including primitive CFU-GEMMs. Isolated CD34+ cord blood cells were expanded in the indicated media plus StemMACS HSC Expansion Cocktail. After 7 days, cells were analyzed for their CFU potential. Cells cultured in StemMACS HSC Expansion Media XF maintained broad hematopoietic differentiation potential, giving rise to all major CFU types, including primitive CFU-GEMMs. Nölle, V. et al., (2016) Recombinant antibodies for improved standardization in flow cytometry. Watts, M.J. et al., (2008) Performance of commercial methylcellulose media for short-term colony assays in routine transplantation practice. ISCT 2008. Miami, Florida. StemMACS™ HSC-CFU Media – Need to estimate HSC differentiation potential? We have the media!